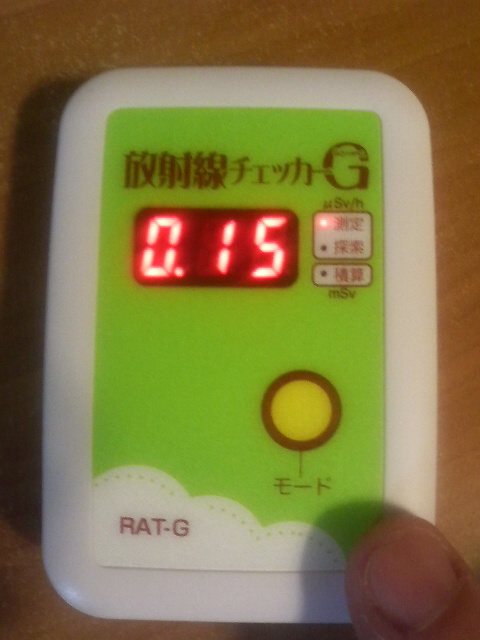 This detector measures radiation in microsieverts per hour. There's a bit of variation, anything from less than 0.05 (which just reads as 'low') to about 0.2. These kind of readings are very miniscule, reflecting natural background levels of radiation that are found anywhere in the world. For example, this measurement above of 0.15 micro/hr works out to 1.3 millisieverts a year, well within background radiation. Yesterday I went for a walk along the stream near my house and the readings were the same. On the weekend I'll go up to the park underneath the zoo up the hill from this apartment, and post some readings from there. I have heard that last year people were concerned at readings from the park, due to 'caesium accumulating on the leaves'. It looks increasingly likely that at least some nuclear power reactors will be restarted before the summer reaches its peak. Specifically, reactors at the Oi power station in Fukui prefecture are being targeted for imminent restart in order to prevent power shortages in the huge Kansai region. It is known that the prime minister supports this move, and today the governor of Fukui prefecture toured the power plant to 'ensure its safety'. Amongst other things, new diesel generators have been installed on a hillside above the reactor to power cooling systems in the event of a devastating tsunami. There's that reflective hindsight again: if only the Japanese could turn their technological prowess to the production of time machines! They could go back in time and save Fukushima! Speaking of these expensive (and largely redundant) safety measures, a meeting of experts in Fukui on Sunday to present a safety report was interrupted repeatedly by shouting protestors. The meeting had to be adjurned and reopened in another room, and this time the anti-nuclear activists were prevented from entering. They responded by denouncing the meeting and complaining loudly that democracy was being subverted when the public was not allowed to attend important meetings. Oh, well. Maybe those activists would prefer to have even more deaths caused by unnecessary evacuation. The Yomiuri Shinbun has reported 573 deaths as 'related' to the disaster. These were people living in evacuation centers in the days, weeks and months after the nuclear 'crisis'. In the general chaos of a genuine disaster that killed 20,000 people, many were left in conditions of extreme fatigue, old age and chronic disease without adequate health or nursing care. Now, a large percentage of these people were elderly, but there is no doubt that many would still be alive today if they had been allowed to stay in their homes. As comparison, this is about 10 times the entire death toll from radiation in the Chernoby accident. If that doesn't make you think the dangers of radiation are exaggerated, I'm not sure what would. I have similar device and in Japan I measure about same values as you do. Recently I was back home in Torino, Italy and brought the device with me. I had much higher readings there than in Japan ! In some places I read more than 0.7 microSv/h. About 5 times ! Never saw these values in Yokohama, so I contacted the local police. They put me in contact with the national environment agency. After few mails exchanges, they sent me their data. In Torino, Italy, 0.3 microSv/h is considered normal (! ), and they told me that they know that in Torino in some spot it can reach 0.7 and more. I understood that the reasons are not firmly known, but presumably these levels are due to a mixture of radon gas, naturally radioactive stones and latent effects of Chernobyl accident. Later on this May (during golden week) I lent my Geiger device to a family that went on vacation in Fukushima region. When they came back with the device, they reported me the values they read there, between 0.3-0.7 microSv/h. About 5 times we measure here in Yokohama, same as in Torino...! The conclusion to me is: Torino, Italy, no accidents same as Fukushima, Japan after an accident. I cannot agree more with Captain Cassowary: the evaluation of the radiation risk in Japan was extremely exaggerated. A top credit debt a good cause is trying the sheer numbers of families using these people with regard to allow around payday cash loan financial obligations that will 2x the. bill nonprofit charities claims around buy the particular payday, substantial desire financial products this holiday season. The actual aid organization reveals 36 months before the sheer number of shoppers using them was initially minor.